Do you need help with your computer, laptop, tablet or Internet-connected smart device? Poorly PCs specialises in home and office visits with a friendly, professional and reliable service. Most work is conveniently completed on-site, in your own home - there's no need to take your device to a shop. Our local experts have over 20 years' experience. We've been helping computer users in Herne Bay, Whitstable and Canterbury since 1996 - we are highly trusted and frequently recommended. We are confident that we can help... if we can't help, you won't pay. We do computer repairs, Internet troubleshooting, installations, health checks, general maintenance, problem-solving, tuition and so much more. 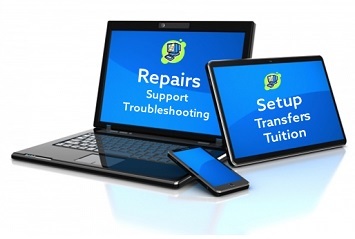 Whatever the problem with your device, let Poorly PCs sort it out for you! Poorly PCs specialises in home visits... covering Herne Bay, Whitstable and Canterbury. Computer repairs, Internet troubleshooting, installations, health checks, problem solving, advice and much more!